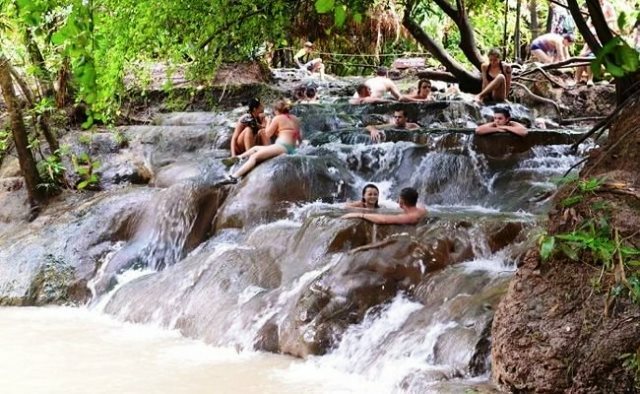 A visit in the Crystal Lagoon in Khao Phra Bang Khram Nature Reserve won’t be complete without stopping by at Klong Thom Hot Springs, a must-see attraction in Krabi. Situated at the heart of the jungle, the place shows naturally-formed Jacuzzis lined with smooth stones, filled with thermal spring water ranging from 35 -40 degree Celsius. The underground old volcanic chambers, producing thermal activity all year round, warm the spring waters. This makes for some luxurious natural springs, giving tourists the opportunity to enjoy bathing as well as healing from illnesses. It is believed that the mineral deposits in the water promote healing of common illnesses including skin disorders, sciatica and rheumatism. Even though modern medical experts will reveal no scientific evidence on the spring’s healing power, the locals swear by its effectiveness. Nonetheless, whether it has curative power or not, the mere dipping in hot water and cozying can already clear the mind of stress and bring relaxation to the body. Certainly, this is an exceptional natural spa for people who want to unwind and improve well-being. Another interesting site near Klong Thom Hot Springs is the Klong Thom Hot Waterfall. The waterfall comes from the leakage of underground hot water to the surface: just imagine a hot spring flowing down a slope. This is the perfect place to release stress and body aches and takes pleasure together with the cool nature and forest. This waterfall is unique because, in addition to the hot spring pools in Klong Thom, the flowing hot water is emptied down in chilling stream below, making the bath a combination of both cool stream water and hot water from the fall. Perhaps there’s nothing more relaxing than this hydrotherapy bath. Besides the Klong Thom Hot Springs, the Klong Thom district is filled with many must-see attractions including the Wat Klong Thom museum that provides insight on the Krabi history, which is mostly disregarded and unknown to a lot of people. Oftentimes, a temple visit is part of the Krabi daytrip tour package including some highlights like the hot springs, nature trail and the Shell Cemetery. The temple museum exhibits prehistoric artifacts that were discovered buried in Khuan Luk Pat. These artifacts include stone tools, bronze tools, and pottery shards, metal coins, colored bead and stone decorations thought to be 5 000 years old. The place is located 70 kilometers away from Krabi town and it is near the Khao Phra Bang Khram Nature Reserve, which is right at the heart of the forest. When going to Klong Thom Hot Springs, don’t forget to bring necessary stuff like a beach towel, swimming attire and a pair of comfortable sandals. The nature park is open all year round and the entrance fee costs 90 baht. Booking for an excursion package is more convenient, so just shop around for prices and services. The best time to visit is before 11 am or, ideally, from 7 am to 8 am and during afternoon, from 4 pm to 5 pm. There are plenty of travel agencies in Ao Nang offering a one-day Krabi tour package.